Lawmakers are urging the Pentagon not to impose across-the-board furloughs if some agencies and offices within the department can come up with the savings to avoid them. Maine Sens. 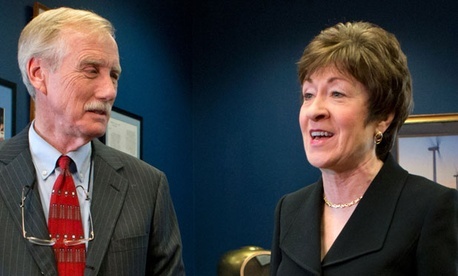 Susan Collins and Angus King are questioning the department’s approach to spread furloughs evenly among affected employees to maintain fairness and possibly to avoid legal action. “While we appreciate these concerns, we strongly believe there will be equal or greater morale issues and potential legal actions if DoD components are forced to implement automatic, across-the-board furloughs that can be avoided in part upon plans developed and recommended by each entity’s leadership to your office,” stated the April 17 letter from the Republican and Independent. Some parts of the department, including the Navy, have expressed confidence that they can find cost savings in the budget to avoid civilian furloughs. They’ve also said furloughs might end up costing more in terms of readiness than they would save in dollars. The Pentagon for several months has warned that it will have to furlough most of its 800,000-person civilian workforce under sequestration. Active-duty military personnel are exempt from furloughs. Defense Secretary Chuck Hagel announced last month that the number of civilian furlough days would be reduced from 22 to 14. Officials have said they are trying to reduce unpaid leave to 7 days. The continuing resolution funding the government through the end of fiscal 2013 gave Defense more flexibility to deal with the sequester. Hagel said earlier this week in congressional testimony that the stopgap spending measure had fixed some, but not all of the department’s “urgent problems,” and he is seeking additional authority from Congress to shift money in its budget to help navigate sequestration. Hagel and Defense Comptroller Robert Hale both have said they want to be fair in applying furloughs throughout the civilian workforce. There also are concerns that employees could take legal action over unpaid leave if they believe it is not being doled out equitably. Collins and King also said that furloughs might not be necessary at all at Defense if the department asked for additional funds for the conflict in Afghanistan. “If the conflict in Afghanistan is costing more than expected for fiscal year 2013, we stand ready to consider such a supplemental request so that you do not have to borrow from the resources provided in DoD’s base budget,” the letter said. Hagel told lawmakers this week that the department is facing a $22 billion shortfall in its operation and maintenance budget, in part because of increased transportation costs associated with the military’s presence in Afghanistan.